This is the website of Pests Birds and Bugs Limited, (hereinafter referred to as PBBL), of Copperfield, Pitmore Lane, Sway, Lymington SO41 8LL a business that provides pest control and environmental services. We will do our best to answer accurately queries e-mailed to us by you but in our sole discretion, reserve the right not to answer such queries. Such queries and answers do not form a contractual relationship between us and PBBL accepts no contractual responsibility for our responses. This website contains general information and the content is for information purposes only. It does not constitute specific professional advice on any matter nor should it be used as such. Whilst PBBL uses every effort to ensure that the content is accurate and up to date, nothing on this website should be construed as professional advice. We cannot accept responsibility for actions based on the materials contained herein. By using this website, you confirm that you have not relied on any such content. If you require advice on any specific problem, please contact one of our partners before taking any action as a result of the comments made on this site. This agreement by which you agree to abide in exploring and accessing information from this website governs the terms upon which you are granted access to this website by PBBL. This website contains proprietary notices and copyright information, the terms of which the you agree to observe and follow. PBBL will take reasonable steps to ensure that data transported electronically to us via the website or otherwise and stored by PBBL or otherwise is not accessed by third parties. You accept the risk that data transmitted electronically to PBBL via this website or otherwise may be intercepted before reaching PBBL, or accessed from PBBL data storage means by third parties’ unauthorised by PBBL, and may be exploited unlawfully by such unauthorised third parties. PBBL does not assume responsibility for guarding against the access of such unauthorised third parties’. We do not store credit or debit card details on our site. Should you have any queries or complaints about invoicing please call us or email us immediately. We will listen sympathetically to your issues and correct any mistakes. 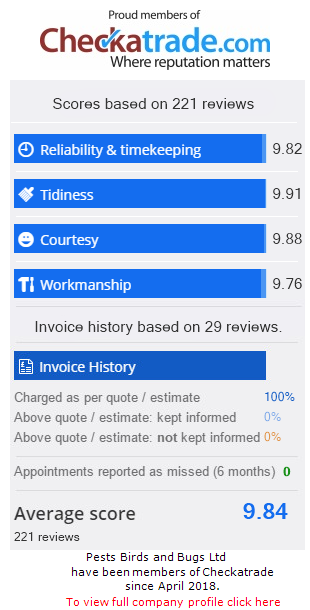 Most work is invoiced PER VISIT unless specifically stated otherwise. Calls made to PPPL may be recorded for training and quality purposes. PBBL makes no representations as to the security, quality or property of any website which may be accessed through this website. Connected websites accessed through this site are independent website over which PBBL does not exercise any control, whether financial, editorial, or of any other kind and are not in any way endorsed by PBBL. Information contained in this website may contain inaccuracies or typographical mistakes. Information may be changed or updated without notice and any queries relating to the information including queries as to its most recent amendment or update and accuracy should be addressed to pestcontrol@pestsbirdsandbugs.co.uk. In no circumstances will PBBL be liable to you for any direct, indirect, consequential, special or other damage howsoever resulting from the use of this website or any other website connecting to the website by means of a hypertext link or otherwise. This shall be the case whether such damage is caused by transmission from this website (or a connected website you’re your computer system, or viruses, worms, Trojan horses or other destructive items, corrupted data or data incompatible with your computer system, or third parties’, interception of or access to data of whatever nature. “Data” includes (without limitation) personal data and credit and payment card information transmitted by you electronically to PBBL or otherwise. Such damage shall include (without limitation) lost profits, interruption to business, loss of the whole or any part of a program or programs, or of any data howsoever stored, whether saved on a computer system or otherwise. The copyright in this website belongs absolutely to PBBL. You have permission to download the contents of this website to your local hard drive for your personal use. You also have permission to copy the content to an individual third party for their personal use provided that you acknowledge the source of the material as being this website and you inform the third party that they are bound by PBBL terms and conditions. Any equipment, poisons, baits or pesticides, tools or documentation that is left on the site of any pest control activity remains the property of PBBL unless specifically itemised and paid for. Any items such as the above may not be removed, sold, modified or touched by the client unless specifically authorised. Signing the Job Sheet acknowledges responsibility for the safe-keeping or our equipment. In the case of Pests Birds and Bugs carrying out ‘bird proofing’ work the onus is entirely on the client to ensure that Planning permission is sought where necessary. PBBL will not be held responsible for installations where planning permission is denied and will charge for removal of any installations. Next visits shown on our job sheets and signed by the client acknowledges that a further visit will be made and may need to be paid for. If the client wishes to query this it may be done either by telephone of in writing by email up to a point 24 hours before the appointment time. Cancellation within 24 hours of an appointment will incur a charge up to, but not exceeding, the quoted price for the job. If you, the customer, or your representative, have any questions with regard to our services then we should be contacted either telephonically or in writing by email immediately. The onus is on the customer to check the paperwork as completed on site and contact us if there is a question. PBBL will refund, in full, any payments taken by card or other method* if the transaction is proven to be unauthorised or taken in error. If the customer, has any issue or query in relation to a completed treatment or payment transaction, they must notify PBBL, in writing, within 48 hours of the date of the site visit or payment transaction date. Our customer services team will contact you within 24 hours (working days). These terms and conditions and the relationship between you and Pests Birds and Bugs Limited shall be governed by and construed in accordance with the Law of England and Wales and Pests Birds and Bugs Limited and you agree to submit to the exclusive jurisdiction of the Courts of England and Wales.